What is a fairy garden? It’s a miniature garden for fairies to live in. My 3 year loves Tinkerbell and after we had watched Tinkerbell and the Great Fairy Rescue we were inspired to make our own together. Since then we’ve made a couple, both temporary houses indoor and a few permanent fairy houses outside. 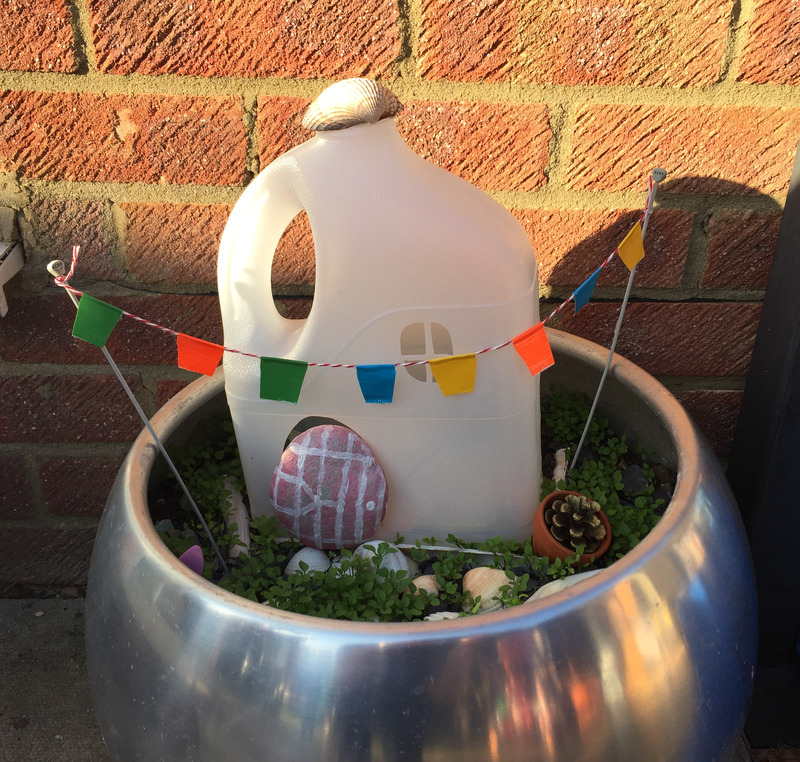 Creating a fairy garden is a great activity that all the family can do together and is a great way to spend time enjoying the sunshine. The best thing is that they can be added to over time so why not start a fairy garden and watch it grow over the summer? Today I’m taking part in a blog hop hosted by Nicolette from Powerful Mothering, sharing my top tips for creating a Summer fairy garden. Find a container or spare patch of garden to make your own fairy garden. 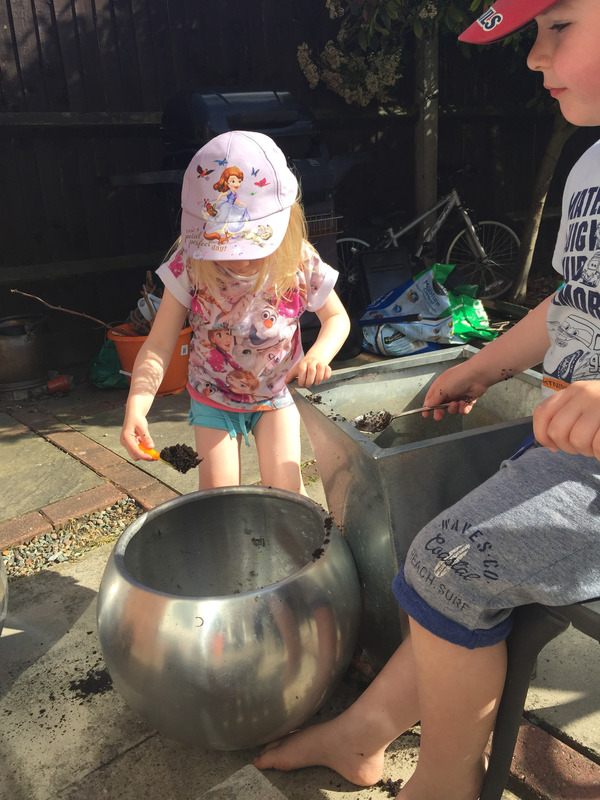 I gave the children an empty flower pot which they had lots of fun filling with soil. Define the edges with a small fence or stones. Build a house for the fairies. 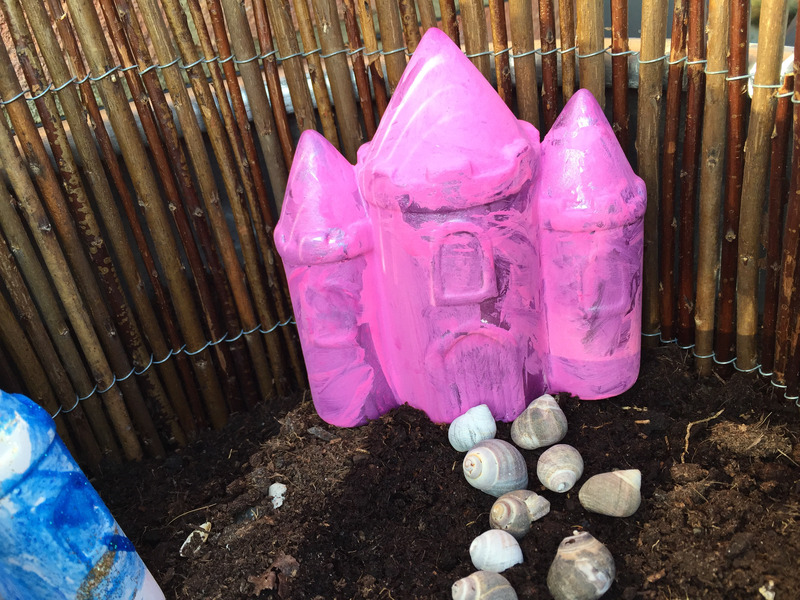 We’ve used upcycled milk bottles and these fun ceramic castle money boxes from Baker Ross which the children painted. You can make a house from palm fronds, an upturned flower pot or wooden bird box; recycled or natural materials are good. Add a water feature, such as a tiny container of water. Add depth with a fence and create paths, we used sea shells from a summer trip to the beach which is an instant visual reminder of a lovely holiday. Plant flowers, especially if your fairy garden is going to be permanent feature in your garden. Certain plants will attract bees and butterflies so why not pop to your local garden centre and ask for some expert advice. We’ve been cultivating a kitchen window sill garden which we’ll plant in our container fairy garden soon. We’ve had fun making miniature furniture to decorate our fairy garden. So far we’ve made duck tape bunting and hung it from knitting needles. We also added a swing from a small craft stick and hung it from a branch. Add lights to light up your fairy garden at dusk. I saw a really fun idea on Pinterest for stones painted with fluorescent paint to glow in the dark. Think about hanging a bell so you can hear when someone opens the door. We still have some ideas to make our fairy garden more fun such as adding edible treats to attract the birds. We’ve made bird feeders before and thought we’d try some on a smaller scale. Follow Jenny Makes’s board Outdoor play ideas on Pinterest. And visit the other participants for more fun ideas and resources for Summer activities with the kids! Thees are such great ideas. I really love what you did with the plastic milk bottle. Very creative indeed. I love these little fairy gardens! Lovely idea about the stones with light up paint too, really cute! Fun Summer Activities for Kids!